An article on our director, Nina Donkin, was in the Manawatu Standard on the 22nd of March 2011. Follow the link below to see the article. Fourteen-year-old Nina Donkin believes teenagers should have hard things to do, just to prove they can. So she's doing something difficult – directing a musical with a cast of 37 that will be performed at Palmerston North's Globe Theatre in late May. "And it's so much fun," she said. "It's a stretch, but it's fun. I'm learning that you can do just about anything that you put your mind to doing." The musical is Psalty, and the story features a singing songbook that tries to stretch time for children who are running out of it, to finish a project. Instead, they go back in time, and find themselves in various historical and Biblical scenes – such as in Solomon's Temple, and with David and Goliath. "We've sung along to the songs in this musical for years," said Nina, of her family. "And we said months ago, that we should make this musical." She and her mother, singing teacher Debbie Donkin, sent away for the script, and held auditions. Some people came from Nina's home-school network, some from city churches, and some from previous productions she's been involved with. "Psalty is an adult part, and he's being played by John Aldersley. We were in Joshua; A Song of Redemption together, so he knew my work." Twenty of the cast are children, aged from seven to 14. "What's interesting about directing is that you have to see it all in your mind, then make it happen. It's multi-track thinking. I've had to learn so much, especially with lighting and sound." She's also learned to use the expertise and experience held by the cast. She's working out choreography, with her senior dancers. Mrs Donkin is musical director. Nina's grandmother, an expert seamstress, is advising on costumes. The production's been given a big box of costumes by the Gateway Church. Nina's previous theatrical experience has been singing and acting. As well as her part in Joshua, she's also been in another church production, In the Shadow of Messiah. 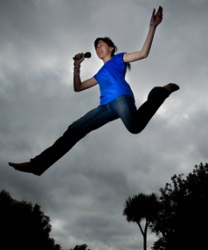 She's sung in concerts all her life, and was the 2009 Reach for the Stars intermediate solo winner. And last year she won a special Trinity College award for the best grade for singing in Manawatu-Whanganui, for grades six to eight. She was sitting grade six at the time. "And I was a teaspoon in Beauty and the Beast [in 2008]. There weren't actually meant to be parts for children in that one, but six of us were so keen that [director and choreographer] Dean McKerras sorted out parts for three teaspoons and three sugar cubes," she said. Nina's lately been reading 'Do Hard Things: A Teenage Rebellion Against Low Expectations', written by American homeschoolers Alex and Brett Harris. "I think some people think being a teenager is an excuse to muck round, but it's bad for people to have nothing expected of them. I think expectations work. Mum tells me that she expects me to do certain things, and I do." Doing things leads to the confidence that competence gives people. Buttoning that competence up to passion for something, and to belief that it can be done, and expectations are exceeded all round, she says. "It doesn't matter what other people appear to think. If you believe in yourself, and if you feel really strongly about something, do something about it." Something she feels really strongly about is having theatre productions of excellent quality that anyone can go and see without being shocked or offended. "Family Friendly Productions. That's the company I'd like to set up." Nina has been home-schooled since year 6, with a break to go to secondary school in year 9. She decided she preferred home-schooling, however, because of its freedom to follow her interests. Mrs Donkin, who teaches Nina and her younger brother Stan, says she expects them both to attain a university-entry level qualification, to have a sport or sports they enjoy, and cultural activities. Nina sings – her voice is a developing soprano coloratura. She practises the Brazilian non-contact martial art capoeira, which was one of the development points for break dancing. She used to roller skate competitively, but an injury stopped that. "So now I'm a soccer hooligan instead," she said, laughing. Nina Donkin's directing debut is fittingly a musical about atime machine, for Nina is only 15. Psalty and the Take-Your-Time Machine has a nearly 40-strong cast, including 20 children. Psalty, a singing songbook, tries to invent a machine to stretch time but instead invents one that goes back in time. Visits include Solomon's temple, David before he kills Goliath, the White House in 1905 and John Newton's church to sing Amazing Grace. The Psalty cassette tape is a favourite of Palmerston North's Donkin family and they would sing away to it in the car. Mum Debbie is a singing teacher and had always wanted to stage Psalty. She realised she needed to act soon as her children were growing up. The production has grown from a family one to being at the Globe Theatre with Mrs Donkin the musical director. Nina said it had always been her dream to direct a play and she believed in making dreams happen. Nina, who is home-schooled, said directing was exhausting but great fun. She also plays Hannah, a part requiring her to be on the stage the whole time. Nina is also making costumes, helping with the choreography, organising the making of props and facilitating meetings between backstage crew. But she said family and friends had been "amazing" – her favourite word. Auditions were held in November and the cast given CDs to learn their songs over summer. Rehearsals started in February. The children all have "lovely" voices. "They have been amazing – like sometimes they drive me crazy, but they are absolutely wonderful kids." Psalty is being staged by Family Friendly Productions, its first show, but "hopefully not the last", Nina said. Nina has learnt to alter her directional style depending on whether she is talking to adult or child cast members. "I just have to make sure I'm not talking to [the adults] the way I talk to the children." to look like what I want it to, so that's good." Asked what she had learnt, Nina replied: "I've learnt not to try and do everything myself even though I do normally, to rely on my family and friends to expect them to do things and know that they will do it, but not to put too much pressure on them." Nina's brother Stan, 12, is in the show and was making a time machine from an old dishwasher the day The Tribune visited. Nina's previous shows include Joshua: A Song of Redemption and Beauty and the Beast. "I just love all things performing, pretty much." From her first musical experience at six, she was hooked. After completing her schooling, Nina would like to be involved in theatre and film production. "I would love to do it professionally, I'm just waiting to see what is in store for me really." But her motto is to live one day at a time. Psalty and The Take-Your-Time Machine is at Globe Theatre, May 26 and 27, 7pm; May 28, 2pm and 7pm. Tickets $10, available from Manawatu Theatre Costume Hire, Princess St. Ring (06) 358 8699.